Scientists don’t really know what color dinosaurs were. Sure they make their guesses. As does Hollywood. But who’s to say some of them weren’t rainbow colored? With heart-shaped scales? Before I get goin’ – I just saw there’s a sale at Ellen’s on all MFT this weekend! I honestly didn’t plan that but hey – pick up the Cuties in this video or the Chemists in my guest video at MFT – for 20% off with coupon code meetMFT! 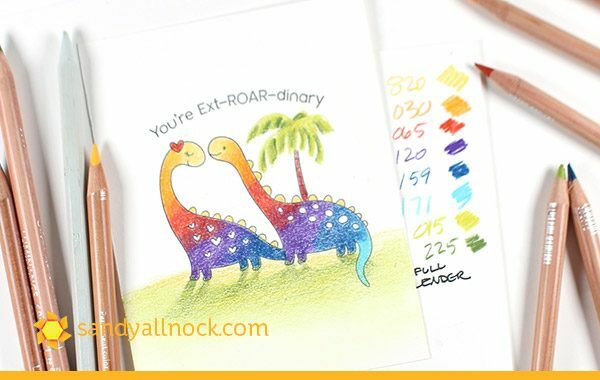 If you’re interested in learning more about your colored pencils – whatever the brand – check out the Colored Pencil Jumpstart class. 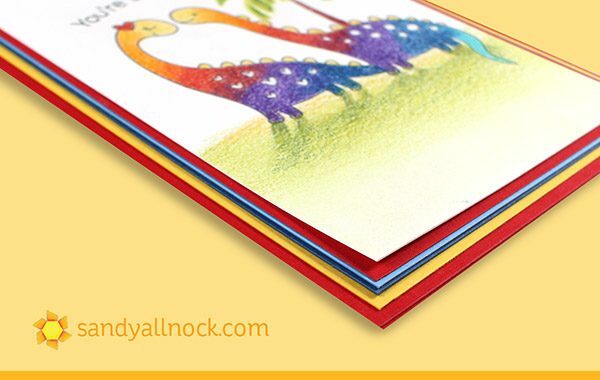 I added to the rainbow feel of the card by adding a lot of colored layers of paper – I used up a bunch in the stash! (That’s a goal for 2019, stop hoarding paper and just use up what’s already cut!) Look how yummy and rich a card looks with lots of layers!?!? This cute card didn’t even show up in my YT feed for some reason. Glad I bounced over here because it’s so adorable! Look – rainbow dinosaurs! And I love the palm tree. You make teaching so understandable. It’s a beautiful layered card! 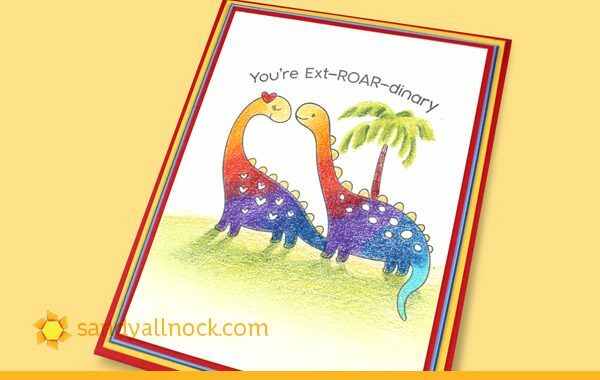 There just had to be rainbow dinosaurs. You have to believe. This one got a laugh of approval and a “that’s cute” from my husband. Those are awesome. Thanks for sharing and the idea of rainbow animals. 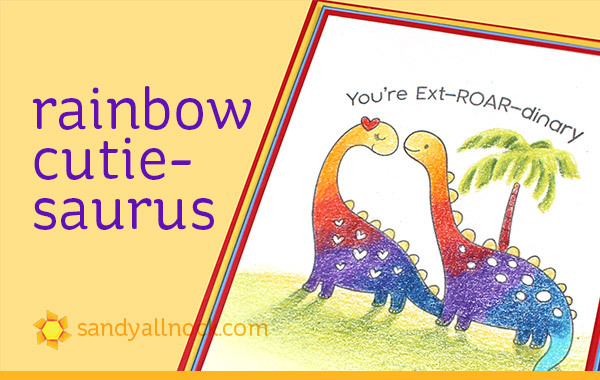 I love the rainbow dinosaurs, they look so in love. The complete card is so cute, thank you so much for showing Sandy and have a geat weekend.